A former paratrooper has raised over £75,000 thanks to a chance encounter with a woman who shared details of his charity efforts on Facebook. Paula Modeste posted a selfie with Jeffrey Long at Windsor train station after chatting about his Thames trek. At that point, Mr Long had raised £300, but comedian Jason Manford spotted the post and shared it with his fans. The 86-year-old said he was "overwhelmed" and wanted to take Mr Manford out for a meal as thanks. Mr Manford has told the BBC that he would "love to meet Jeffrey" and praised the powers of social media. 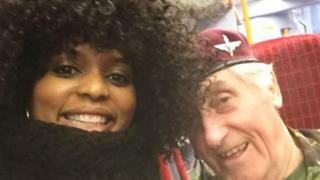 Mr Long was walking "86 miles for 86 years" - from the Thames Barrier to Caversham in Reading - to raise money for the Poppy Appeal, when Ms Modeste stopped to chat to him on Saturday. She posted on Tuesday morning that he was armed with a "keen sense of direction and a massive heart". Ms Modeste, from Forest Hill in London, explained that Mr Long was "not social media savvy" and urged people to donate to his online fundraising page. "He's so deserving," she said. "His name is Jeffrey Long MBE and he is a legend." Her Facebook post was shared thousands of times, before Mr Manford also posted about Mr Long on both Facebook and Twitter. As the amount raised grew throughout the day, Mr Manford asked his followers: "Is anyone else just sat there refreshing the Just Giving page and smiling so hard? "I love the fact Jeffrey is not on social media and I imagine won't even check his JG page till tonight when he's finished. He's in for a shock." 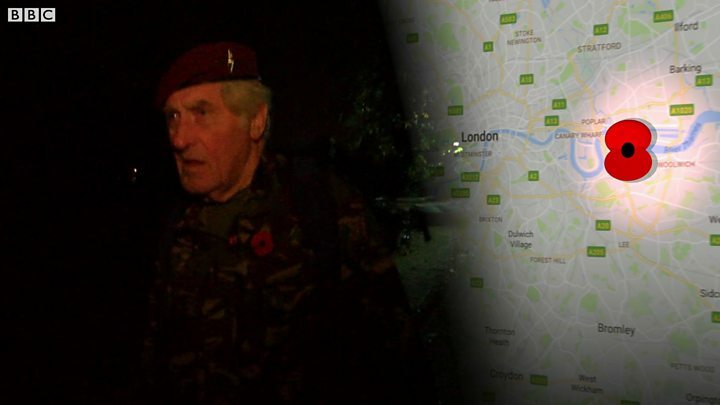 "I'm overwhelmed to be honest," said Mr Long, from Bingley in West Yorkshire, as he completed his walk dressed in full army camouflage on Tuesday evening. "It just shows you what can be done."